The Jobst Travel Socks for Men and Women are designed to counteract the effects of inactivity during travel. Jobst Travel Socks apply gradient compression that is clinically proven to help your legs. This gradient compression is highest at the ankle and tapers off up the calf to promote the blood flow in your legs, prevent leg discomfort and swelling, and reduce the chances of blood clot formation. In addition, Jobst Travel Socks energize the legs, leaving travelers more refreshed when they reach their final destination. 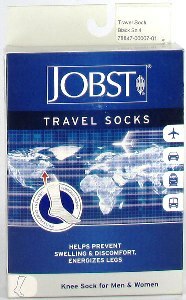 Jobst Travel Socks are durable, high-quality knee socks with a soft cotton blend and stylish dress pattern. 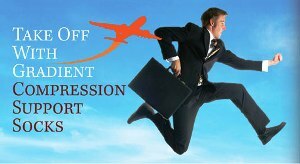 They are the perfect choice anytime – on the plane and off; any attire – business and casual; anyone – men and women. It's no wonder that Jobst is the #1 Physician Recommended Brand!